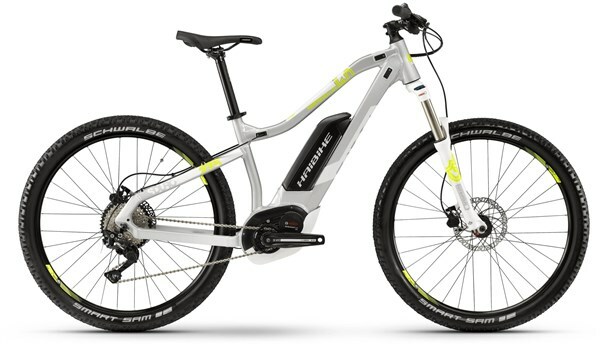 Haibike designed the Life Line especially for women without compromising on power or performance. The hardtails and fullsuspension models also offer comfort and safety, providing a perfectly adjusted geometry engineered for women. Shorter stems, adapted specifications, special saddles and extra small frame sizes characterise the Life Line. In the development of the new models, Haibike further optimised the Ladies geometries. For improved control and an ergonomic sitting posture the head tube was lengthened; for more comfort and safety Haibike reduced the stand-over height of the top tube. Crank length, handlebar width and brakes were adjusted as well in order to be able to react even more intuitively and efficiently. The motorisation via drive units of Bosch or Yamaha is as powerful as with the other eMountainbikes of the SDURO family. The SDURO HardSeven Life models are equipped with suspension forks with a travel of 120mm as standard. Bosch Performance CX Drive Unit: Optimized for ePerformance bikes, the Bosch Performance CX motor was developed with a focus on creating a more sport oriented unit. Bosch Purion Display : Small, compact and well protected: the new Bosch Purion. Despite the small size of the remote, the display provides all of the important features and information.